Everything Bagel Kale Chips. Vegan. Gluten free. Okay, okay — kale chips have been around & around the web/blogging/food recipe sites for like EVAHHHH! But I don’t care. Mine kale chips are the best and I’m sticking to that. 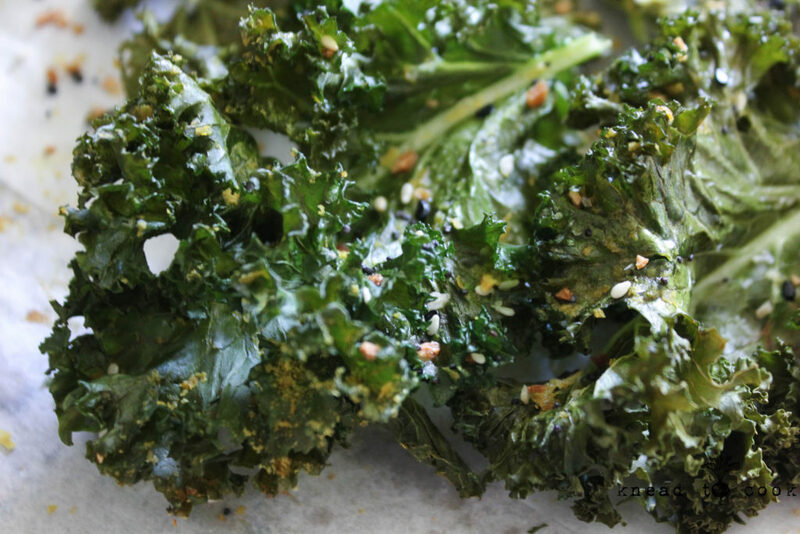 Plus, my garden is bursting with kale & this recipe is on repeat like – daily! Seriously. Even my dad, 79 year old carnivore, adores these babies. And let’s face it, you can eat an entire bowl and have ZERO guilt in your game. So there! Plus 3 grams of protein per cup and loaded with potassium (move over bananas) for another vitamin punch. I find that curly kale is the best for this recipe versus dinosaur version. The curly leaves hold on to all the yummy seasonings. These are always best consumed right out of the oven for optimal crispiness. Okay, okay… let’s get this recipe underway. 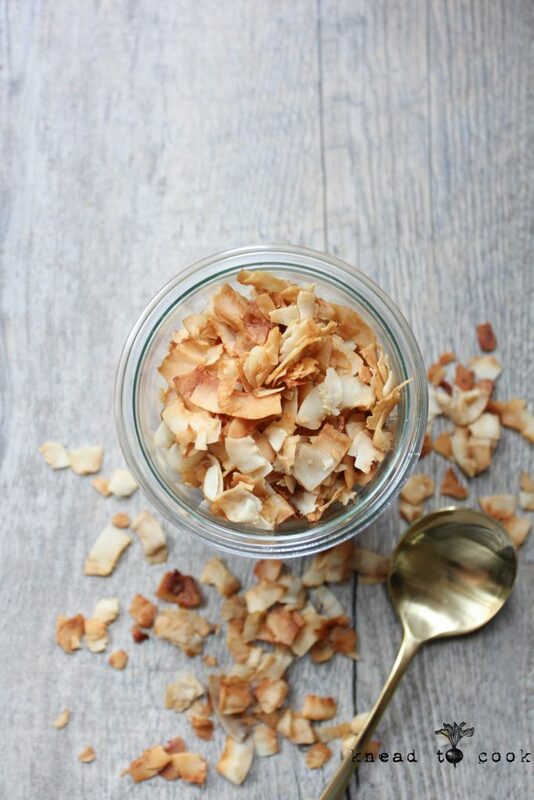 Coconut Bacon Flakes. Vegan. GF. Coconut bacon? Why yes! I first haphazardly stumbled upon this insanely delectable treat a few months ago while traveling. I bought a bag and was addicted at first bite. I brought it home and vegans & non-vegans alike couldn’t stop eating it. I knew I had to recreate it because it would become a staple in our pantry & boy was I right! So it has the smokiness of bacon, the crunch factor & is totally healthy v. the real deal. You can use it virtually in the same manner – like topping you salad, baked potato etc. But wait… this is coconut so let’s travel down other avenues of usage. Topping vegan yogurt (my new favorite is So Delicious), vegan ice cream, cereal, roasted veggies, mixed in granola… anywhere you want to create that sweet/salty/smoky flavor profile. OHHHH and think of all the holiday food you can top with it!?! Mashed potatoes, green beans, asparagus… yum! So many uses & so little time. And yes, straight up eating is also quite acceptable. Do you love beets? Many years ago I wouldn’t touch them with a ten foot pole! Now, I’ve grown to love them. I eat them roasted to raw and pretty much consume them daily. I like to shred many of them in my food processor and keep them for salads, add to smoothies… just eat them out of the bowl. 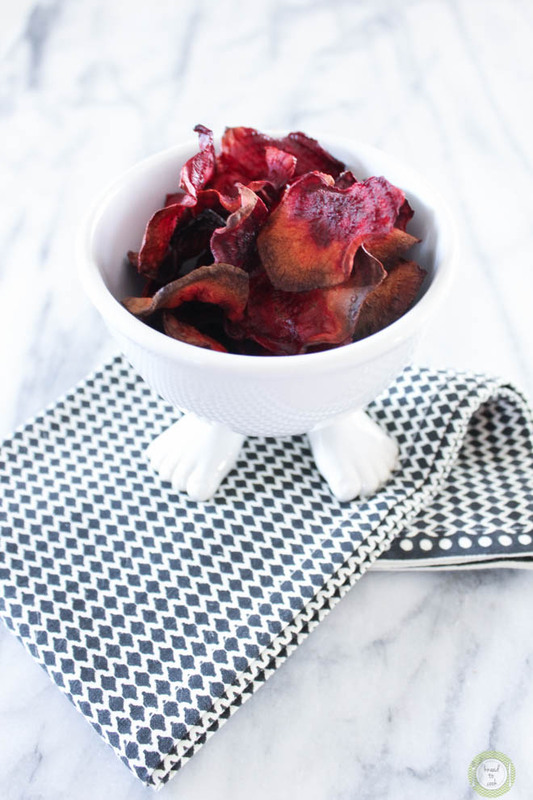 So I thought I would make some chips for my kids – who aren’t fond of regular roasted beets. When I crisp them up and they seem to eat any veggie possible. I love it. I love using olive oil or truffle oil on these for a deeper, more intense flavor. 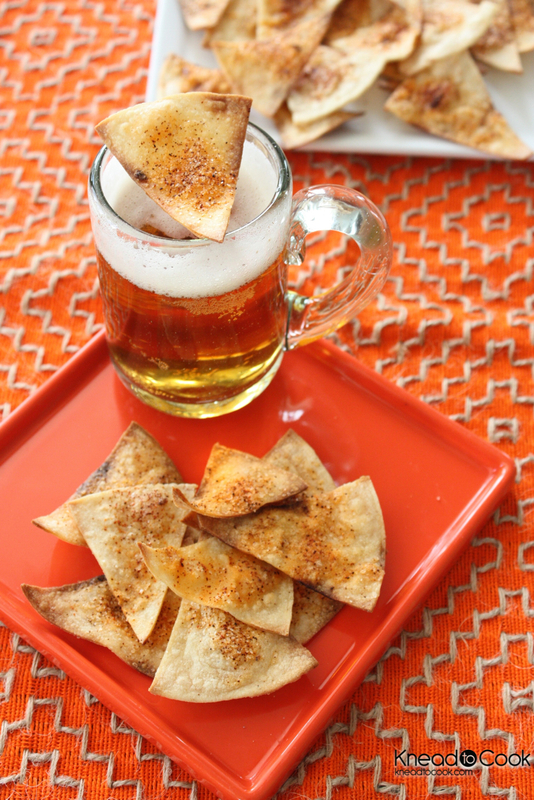 Cinnamon and Spice Apple Chips. After a wonderful fall weekend, we finally got to the apple orchard and managed to pick 40 lbs of various apples. Sunday was then spent cooking, baking and drying apples. 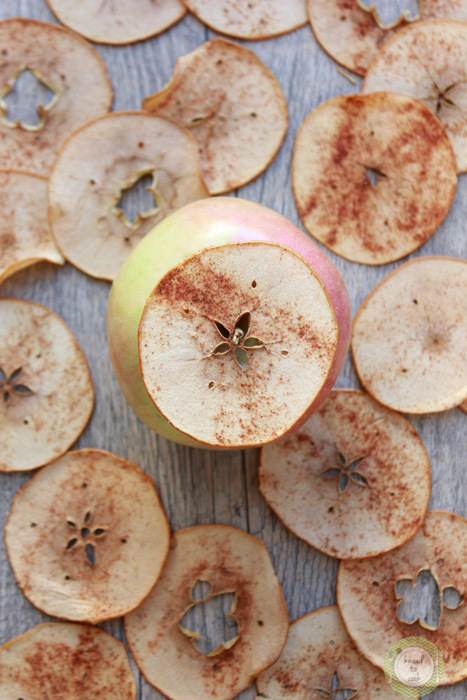 This week I’m going to be posting all apple recipes, hope you love apples as much as I do! 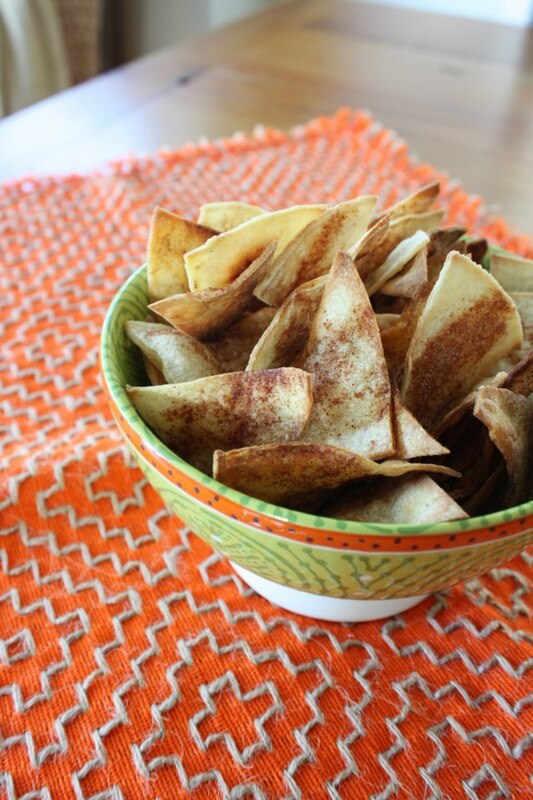 Today I’m starting with a super easy, healthy, vegan apple chip. Kids love them! Adults can’t stop eating them. Perfect for after-school snacking, treats to pack in lunches or a healthy afternoon snack for you. This is a totally fix it and forget it recipe. Fall perfection! 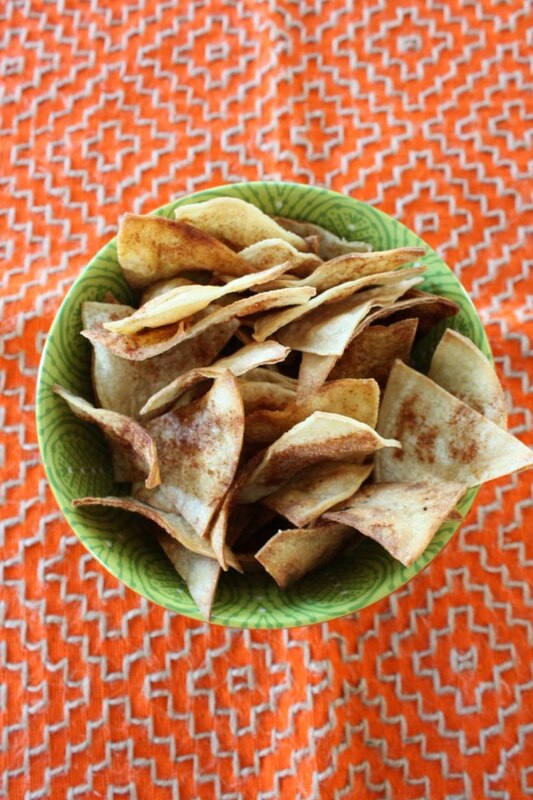 Homemade Tortilla Chips – You pick the flavor! If you’re like me, you hate buying chips from the store. Even the baked versions taste like “manufactured” food. We do it out of convenience but really, after whipping up a bunch of these homemade chips, you won’t go back to the store bought version. You control the spices, flavors and how crispy you want them. Perfect for game day or any party. Also, perfect alongside guac or salsa. This recipe is so easy. Preheat your oven to 400 degrees and pull out two baking sheets. Set aside. Then take your package of corn tortillas and place about 8 stacked up on a cutting board. Cut them in half (doing this 4x) or cut to your desired size. Cut in half. Then rotate and repeat, so you have 4 equal triangles. Then half those. Place on your baking sheet. Now if you’re going a savory route, I spray with an olive oil mister (light coat) then top with you favorite spice. Cumin, cayenne pepper, chili lime sea salt, sea salt. In this batch I used chili lime sea salt from The Mystic Blue Spice Company. First I squeezed fresh lime juice on each chip, then topped with a pinch of the seasoning. If you’re going sweet… spritz with olive oil and then top with cinnamon, cinnamon and sugar etc. If you’re going plain… spritz with olive oil. Baked for 8-10 minutes or until golden brown and crispy.